Cuba identity is linked to devotion to "the Virgin of Charity" The chaplain to the national shrine of La Virgen de la Caridad near Santiago de Cuba explains what this devotion to the mother of Christ means to all Cubans. (La Stampa "The Vatican Insider" 3/28/12). For 400 years, Cubans -- believers and nonbelievers alike -- have brought their sorrows and joys before the little statue of Mary, and even Cuba's communist rulers have claimed her as a cultural icon of the Cuban struggle for freedom and equality. When Pope Benedict visited the Virgin's shrine March 27, he joined the thousands of pilgrims marking the 400th anniversary of the discovery of the statue, and he echoed the prayers of many of them for a future marked by less poverty and greater freedom. Pope asks Our Lady of Charity to protect, guide, help suffering Cubans (Catholic News Service 3/27/11) Entrusting people to Mary's maternal care is a normal Catholic practice, but when Pope Benedict XVI prayed that Our Lady of Charity of El Cobre would wrap her golden mantle around the people of Cuba, it was particularly poignant. Cheers, tears, prayer: Cuban-Americans join Cuban pilgrims in Santiago, by Tom Tracy (Catholic News Service 3/27/12). The U.S. State Department had warned the Vatican that the regime would use Benedict XVI’s visit to protest against the embargo. This immediately materialised upon the Pope’s arrival in Santiago. 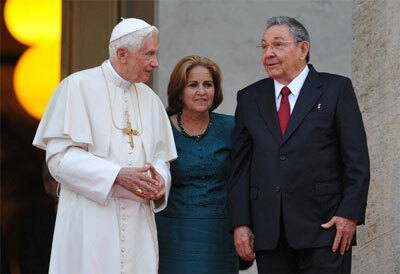 Raúl Castro welcomed Benedict XVI with 21 gun salutes and went on to attack Washington for “the 53 years of hostility against the Cuban revolution,” denouncing the fact that “the U.S.’s political and economic embargo oppresses the island.” Despite this, Castro said, “Cuba is changing; it is broadening its horizons and enjoys good relations with the Church.” Benedict XVI, however, showed no signs of being intimidated by Raúl Castro’s words and said what he had planned to say, talking about his visit as a mission to open Cuba up to the world and the world up to Cuba, on behalf of “the legitimate aspirations and wishes of all Cubans, wherever they may be.” In his appeal against the repression of religious and civil freedom, he also echoed the distressed and inflamed expectations of expats in Florida who have been thundering against the Holy See’s “weakness” towards Castro. 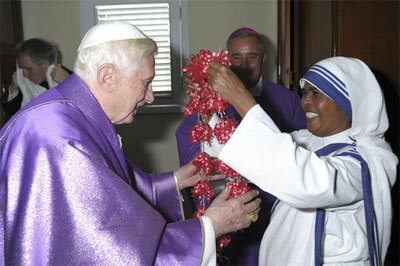 During his first mass celebration on the island where God has been rejected for half a century and the Catholic Church persecuted and deprived of religious freedom, Benedict XVI again suggested “a real theology of liberation, based on testimony of the faith and the freedom of those who open up to God,” the Pontifical Institute for Foreign Missions’ news agency stated. 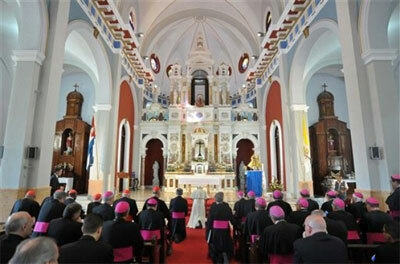 Just after Pope Benedict XVI prayed at a revered shrine in Cuba on Tuesday, calling for the country to move forward “along the way of renewal and hope,” a top government minister made clear that the sweeping economic changes under way here would not be accompanied by political reforms that the pope has urged. The comments from the minister, Marino Murillo, the vice president of the Council of Ministers and the official overseeing the steps toward a freer market, amounted to a rebuttal of sorts to the pope, who in recent days has portrayed the political system here as unworkable and has laced his comments since arriving on Monday with calls for increased liberties. 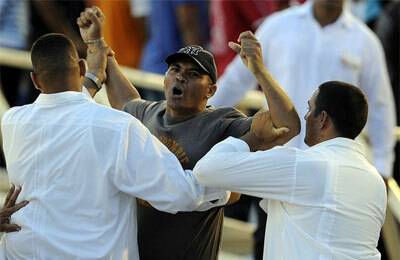 Leading Cuban dissidents say they don't know the man who shouted anti-government slogans before Pope Benedict XVI's Mass in the eastern city of Santiago. Nor do they know his whereabouts a day after security agents removed him from the ceremony. But they say they are trying to find out, and worry he might face punishment. . . . The Cuban government did not respond to requests for comment.